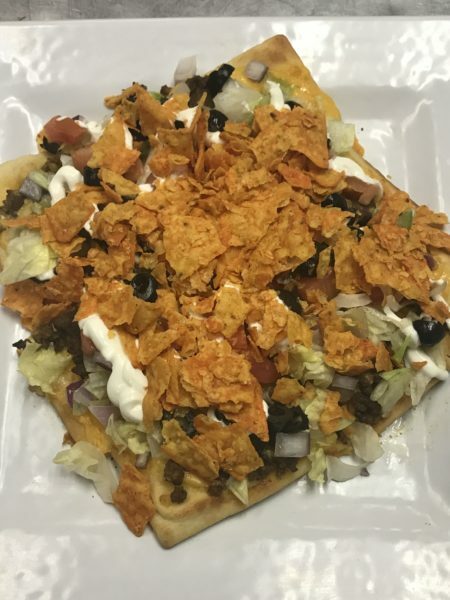 Nacho Flatbread - Nacho cheese sauce base topped with seasoned ground beef, cheddar, lettuce, onion, black olive, tomato, sour cream and nacho chips. Served on flatbread. Strawberry Chicken Walnut Salad - Fresh greens, diced chicken, strawberry, feta cheese and walnuts. Served with a warm garlic breadstick. Honey Mustard Chicken Wrap - Crispy chicken, mixed greens, tomato, onion, cheddar cheese and honey mustard wrapped in a garlic herb wrap.